Past Event: How are Waylanders fighting climate change? Interested in a more sustainable lifestyle, but not sure where to start? 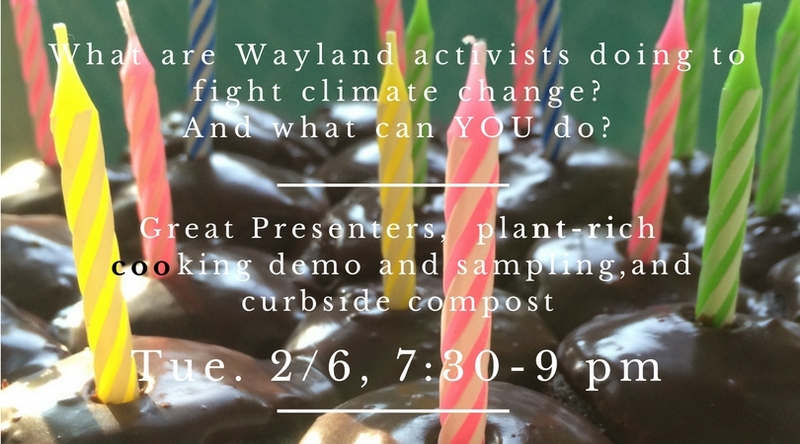 On Tuesday, February 6th from 7:30 – 9:00 pm, local activists Ellen Tohn and Anne Harris will share their work with the Energy and Climate Committee to green municipal energy use, and with www.MassEnergize.org to help residents reduce their household’s footprint. And because switching to a healthy, plant-rich diet is one of the most impactful solutions to reduce dangerous emissions, they’re bringing in Diana Goldman, a local vegan chef and founder of BeantownKitchen.com, to demonstrate some simple, nutritious dishes… and serve tasty samples as well! The event will also feature City Compost, which does curbside pickup of food scraps, expertly composts it, and then returns the black gold to your doorstep for your garden. This is an event in the Wayland Library’s Great Presenters Series. It is free, open to the public, and will provide attendees with helpful tools for a greener life. At the Wayland Free Public Library, 5 Concord Road, Wayland, MA 01778.